After 16 years of working at TVB, Selena Li (李施嬅) announced her departure yesterday and intention to expand her career internationally. Throughout her time with TVB, Selena has never received any awards at TVB. Yet, the Canadian-raised actress has received growing opportunities from the western market. Selena entered Miss Hong Kong 2003 and though she was a favorite to place, she only won the Miss Photogenic and Miss Talent awards. After the pageant, she signed with TVB and became an actress. She began her acting career with a supporting role in The Last Breakthrough <天涯俠醫> and steadily increased her screen time. Memorable roles Selena had were in 2014’s Ghost Dragon of Cold Mountain <寒山潛龍> and 2018’s Succession War <天命>, in which many netizens commented that she was the most beautiful empress. Selena also starred in American short film Once More in which she won Best Actress from the European Cinematography Awards and the Los Angeles Film Awards. 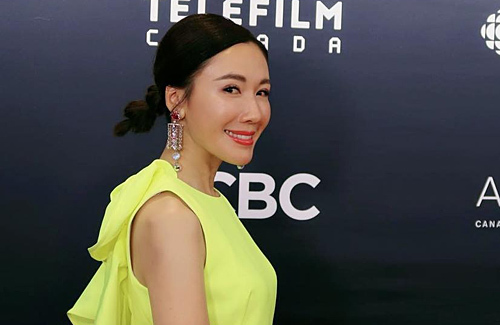 As well, this year she acted alongside Geraldine James in the Canadian drama Blood and Water, in which she was nominated for the 2019 Canadian Screen Awards’ Best Supporting Actress. Selena’s last drama with the station is Forensic Heroes 4 <法證先鋒IV>, which will air later this year. She will be forgotten in no time. @anon yeah.. she’s not that talented nor interesting to watch. good luck to her tho. That’s so strange. I remember reading she wanted to leave a while back, but TVB convinced her to stay and I think the article mentioned she renewed with them. Maybe that wasn’t a confirmed renewal. But good on her; she wasn’t going anywhere with TVB anyways and she’s invested *cough wasted* enough time with them. Hope she finds better opportunities outside of TVB in the future. Selina is too elegant to hang around that crappy nonsense friends group and she has silently broken out to be the best actress amongst them. She doesn’t seem like someone who wants to fight to reach the top though and happy to work part time whilst enjoying life..
@m0m0 I think a tip that all HK actresses can benefit from is to speak in a normal adult voice. Most of them all speak in this HK “I’m trying to be cute” baby voice that is so cringe! This is especially apparent in TVB shows when they have to argue etc and they still try and argue or yell in a cartoon voice. STOP speaking like you’re pretending to be a toddler. It’s NOT cute. I am okay with Selena Li’s acting, but I don’t like her cute voice. Her soft cute voice has limited her acting certain roles with strong and tough personalities. @orchid123 Her acting is fine, she also has this dainty or feminine image as well which you can’t picture her acting as a tomboy (like nancy) or those brash loud characters (like kristin). @orchid123 Thats my problem with her too. Her acting is good but I just cannot get past that super high pitched voice…. That’s too bad. I was just starting to really like her. She was interesting in Succession War. To be honest, I kinda already saw coming. She’s too good for the station and they never acknowledged her. Didn’t win a single substantial award. I’m surprised she didn’t leaver earlier. Although it’s kinda bad timing. Considering the current standards in TVB, she would’ve probably won best actress within the next 2 years. I mean, even Natalie got to win. True, if Natalie Tong could win Best Actress award, Selena Li should have got one too. Will missed her and wonder if her English are any good? I don’t know what tvb is thinking when she doesn’t received any award at least let her win most improvement or supporting? @cutie777 Her English is native level. She moved to Toronto Canada at a young age and studied University here before going back to HK for the pageant. She’s as bland as plain water but so are the rest of the current bunch of actresses that tvb has. The only difference is that the others like Sisley etc (gosh I’m having trouble naming them cos I can’t rmbr their names lol) are younger. Can’t say i will miss her acting but i will miss another familiar face. Lol idk why ppl here are saying she’s plain n bland. Her acting is way better than Myolie who’s supposedly a tv queen. Selena should have been promoted long ago and she would have definitely gotten Best Actress given a good series. Hope she has better opportunities elsewhere. Too bad she is leaving.. she is arguably the only pretty watchable fadan left in tvb currently. I had seen her in person in HK once and she is really pretty, her acting is also good. I think her problem is she is too bland or goody-shoes image and somehow lacks the oomph factor to carry a series.